Elizabeth Finch, Rondi Stearns, and Jackie Bouvier make guests’ AMC reservations (and dreams come true). They’re the headset-sporting heroes who unlock memorable outdoor adventures for anyone who’s eager—AMC members and otherwise. We know them by their warm and welcoming voices, answering our urgent questions and asking us how many beds we need or whether anyone in our group has dietary restrictions. A lot has changed since guests had to mail a letter to AMC in Boston to request a bed in a hut or lodge, but one thing remains constant: The reservations and occupancy team loves helping visitors. 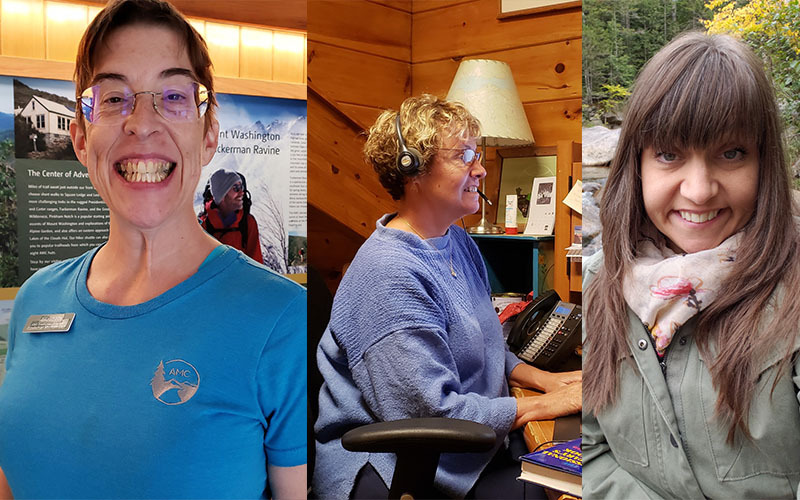 We asked three long-timers—Elizabeth Finch, reservations shift leader, 15 years with AMC; Rondi Stearns, director of sales and occupancy, 12 years; and Jackie Bouvier, contact service center coordinator, 5 years—for their best guest stories and how they approach their jobs. What do you enjoy most about engaging with guests every day? Bouvier: I love helping people plan their trips: talking about trails, weather, gear, et cetera. Stearns: I enjoy learning more about what [guests] want to do and then trying to match it with one of our offerings. If it’s not something we have, should we develop it? How do you approach your conversations with guests? Stearns: Listen to what guests want to do rather than pitching what we have. People aren’t shy about their opinions. Bouvier: I try to remember that many people don’t have a lot of experience in the outdoors. I don’t assume anything. I am here as a representative of the oldest conservation organization in the country, and I want their experience to be stellar. Finch: I treat them as if they were my mother—meaning I am respectful and don’t talk too fast. I enjoy a guest with a healthy sense of curiosity, as that’s a chance for me to give them some useful information about what we do. Is there a particularly poignant or inspiring guest story that sticks out in your mind? Bouvier: AMC member James Wisecup told me such a moving story about staying at Pinkham and then four huts with his 4-year-old son in 1976. Halfway up to Zealand, his son fell asleep, so James carried him and their packs up to the hut. Once they came to the steep approach to the hut, his son woke up and ran the rest of the way, as though he had climbed the whole way. What about a guest interaction that made you laugh? Bouvier: A woman was reserving a campsite at Mohican Outdoor Center in New Jersey. I was going over the amenities, and I mentioned that there are bear boxes. “What are bear boxes?” she asked. “You store your food in them so the bears don’t get it,” I replied. “There are bears?” she cried. She didn’t reserve the site after all. Stearns: A lot of guests want people to carry their stuff. “Do you have Sherpas?” they ask. Plan your own AMC outdoor experience or call 603-466-2727 to speak with one of these friendly pros. Read about the life-changing adventures AMC seasonal staff pursue in the off-season.